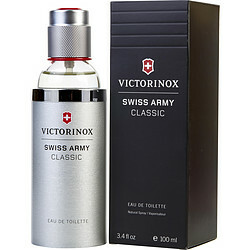 Swiss Army is a scent I find irresistible on my husband. Great price too. Love treating him with this cologne. Swiss Army Cologne is the best smelling Cologne I have ever had smelled on a man. It smells so good. My Insurance agent came Over one day. I had asked him what Cologne he was wearing. "Swiss Army" he replied. I ordered 4 bottles. That was 8 years ago. I order it all the time. My Husband and Son use it. I give it for gifts. I just gave it to my neighbor for Fathers Day. Try it you will love it. Thank you!!! Really glad I ordered through your website. This cologne smells very good, but the alcohol scent overpowers it. It also doesn't last long either. When smelling this cologne it kind of reminds me of Cool Water. I've been using this cologne for years. A great daytime scent that lasts all day!